Epicor Eclipse is a powerful distribution software built to streamline and automate the operations of wholesale distributors in the Plumbing, PVF, electrical, and HVAC industries. It is a distribution-centric system that combines its extensive functionality with innovative technology to impact all facets of the distribution lifecycle. The application allows distributors to digitalize business from e-commerce to mobile sales & services, to customer optimizations tools, to wireless sales counters & warehouses. The platform is an end-to-end distribution system that delivers industry-rich features set with options for cloud, on-premises, and hosted deployments. In addition, Epicor Eclipse streamlines the distribution cycle while maximizing the business effectiveness with best-of-breed processes designed to help distributors reach their productivity goals. Some of its key features include inventory management, order management, advanced demand forecasting, e-commerce, warehouse management, freight audit queue, integrated credit card processing, and financial management. Epicor Eclipse is a modern distribution system that leverages powerful technology to facilitate the transformation and growth of distribution businesses. The platform is designed to allow you to scale, grow, and adapt your distribution business without the costly system modifications. Its ability to offer complete business digitalization together with refined distribution expertise of more than 50 years of experience, makes it the perfect solution for the evolving distribution markets. 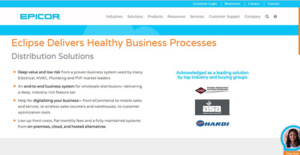 In addition, the system technology supports extended capabilities including strategic pricing, task automation, customer profitability analyzer, and proof of delivery tools. Additionally, Epicor Eclipse comes with time-saving tools built to dramatically improve productivity, while providing process refinements to enhance business effectiveness. One of these tools is the task-focused graphical interface. This visually appealing interface centralizes all tasks in one area to expedite operations and save time. It allows your employees to accomplish more within the software, focus more time on your customers, and deliver professional services to boost customer satisfaction. Whether you are a mid-sized distribution company, an emerging distributor, or a subsidiary of a large multinational, Epicor Eclipse has the industry-leading solution to help you excel. The system builds on the things that matter most to distributors such as work queues, wire cut, job management close counter entry, PO variance queue, inventory management, warehouse management, and more. It integrates all the features to form an end-to-end, feature-rich application that delivers the required depth in a wide range of industries including HVAC, electrical, and plumbing & PVF. If you are interested in Epicor Eclipse it might also be beneficial to analyze other subcategories of Best Distribution Software collected in our base of B2B software reviews. Every organization has different needs and needs a software that can be customized for their size, kind of workers and buyers, and the particular industry they are in. For these reasons, no system can provide perfect features off-the-shelf. When you try to find a software app, first be sure what you need it for. Read some Epicor Eclipse reviews and ask yourself do you desire basic tools or do you want sophisticated tools? Are there any industry-specific functionalities that you are seeking? Obtain the answers to these queries to aid your search. There are plenty of aspects that you need to reflect on and these include your finances, particular business requirements, your organization size, integration needs etc. Take your time, use a few free trials, and finally select the system that offers all that you need to improve your company efficiency and productivity. How Much Does Epicor Eclipse Cost? Epicor Eclipse doesn’t reveal its enterprise pricing details to the public. Contact the vendor for a custom pricing quote. We realize that when you make a decision to buy Distribution Software it’s important not only to see how experts evaluate it in their reviews, but also to find out if the real people and companies that buy it are actually satisfied with the product. That’s why we’ve created our behavior-based Customer Satisfaction Algorithm™ that gathers customer reviews, comments and Epicor Eclipse reviews across a wide range of social media sites. The data is then presented in an easy to digest form showing how many people had positive and negative experience with Epicor Eclipse. With that information at hand you should be equipped to make an informed buying decision that you won’t regret. What are Epicor Eclipse pricing details? What integrations are available for Epicor Eclipse? If you need more information about Epicor Eclipse or you simply have a question let us know what you need and we’ll forward your request directly to the vendor.